The late Antony and Mariamma Pulickal are his parents. 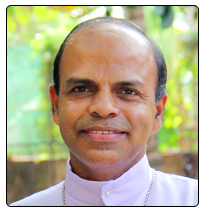 Born on March 3, 1964 at Inchiyani under the diocese of Kanjirappally, the Bishop completed his primary school education from Holy Family School, Inchiyani, High School at CMS, Mundakayam, and Pre-degree at St Dominic’s College, Kanjirapally. He then joined minor seminary of the diocese of Kanjirappally at Podimattam for priestly formation. After completing studies on Philosophy and Theology at St Thomas Apostolic Seminary, Vadavathoor, he was ordained a priest by Bishop Mathew Vattakkuzhy on January 1, 1991. Soon after the ordination, he served as an assistant vicar of St Dominic’s Cathedral Church, Kanjirappally. Cardinal Alenchery and Bishop of Kanjirappally Mar Mathew Arackal presented the bishop-elect with the insignia of Episcopacy. All the Bishops attending the Synod of the Syro-Malabar Church were present on the occasion. He was ordained bishop on 4 February 2016.